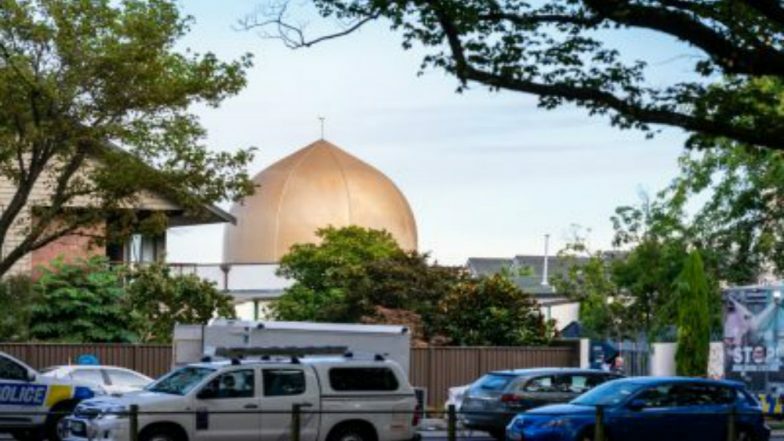 Christchurch, March 22: New Zealanders observed the Muslim call to prayer Friday in reflecting on the moment one week ago when 50 worshippers at two Christchurch mosques were slain — an act an imam told the crowd of thousands that had left the country broken-hearted but not broken. In a day without precedent, people across New Zealand listened to the call to prayer on live broadcasts while thousands, including Prime Minister Jacinda Ardern, gathered in leafy Hagley Park opposite the Al Noor mosque, where 42 people died. "New Zealand mourns with you. We are one," Ardern said. The call to prayer was observed at 1:30 pm local time and followed by two minutes of silence. Hundreds of Muslim men at the park sat in socks or bare feet. One man in the front row was in a Christchurch Hospital wheelchair. The Al Noor mosque's imam, Gamal Fouda, thanked New Zealanders for their support. New Zealand: Mass Shooting at Two Mosques in Christchurch, Six Dead. "We are broken-hearted but we are not broken. We are alive. We are together. We are determined to not let anyone divide us," he added, as the crowd the city estimated at 20,000 people erupted with applause. New Zealand Mosque Mass Shooting: Bangladesh Cricket Team Unhurt, Tamim Iqbal Tweets About Safety. "The moment I landed in Christchurch, I could feel the love here. I've never felt more proud to be a Muslim, or a Kiwi for that matter. It makes me really happy to be able to say that I'm a New Zealander," Imam said. He called it surreal to see the mosque where he used to pray surrounded by flowers. The observance comes the day after the government announced a ban on "military-style" semi-automatic firearms and high-capacity magazines like the weapons that were used in last Friday's attacks at the Al Noor and nearby Linwood mosques. An immediate sales ban went into effect Thursday to prevent stockpiling, and new laws would be rushed through Parliament that would impose a complete ban on the weapons, Ardern said. "Every semi-automatic weapon used in the terrorist attack on Friday will be banned," Ardern said. The gun legislation is supported not only by Ardern's liberal Labour Party but also the conservative opposition National Party, so it's expected to pass into law. New Zealand does not have a constitutional right to bear arms. Among those planning to attend Friday's observance was Samier Dandan, the president of the Lebanese Muslim Association in Sydney and part of a 15-strong delegation of Muslim leaders that had flown to Christchurch. "It was an ugly act of terrorism that occurred in a beautiful, peaceful city," Dandan said. He said his pain couldn't compare with that of the families he'd been visiting who had lost loves ones. He was inspired by their resilience, he said. "And I've got to give all my respect to the New Zealand prime minister, with her position and her actions, and it speaks loud," he said. Ismat Fatimah, 46, said it was sad to look at the Al Noor mosque, which was still surrounded by construction barricades, armed police officers and a huge mound of flowers and messages. "We're feeling stronger than before, and we are one," she said. She said she prayed for the people who died. "I'm just imagining what would be happening last Friday," she said. "People were running around so scared and helpless. It's just not right."